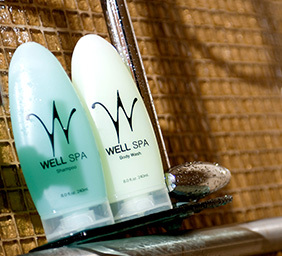 Your WELL Spa + Salon experience doesn’t have to end just because your treatment is over. Now you can buy many of the products we use in-house and can bring the professional spa home with you. The exclusive collection of products we offer are scientifically proven to work, using only the purest components in their unique formulation. Learn more below and you’ll be sure to add them to your daily body and hair care routine. The Redken Color collection protects your hair with optimum color security with an exclusive Conditioning system and Fade Resist Complex. As one of the most trusted brands in the hair care industry, Redken ensures your hair will stay vibrant and colorful. Living Proof hair care products were scientifically designed by researchers from MIT. The patented technology protects you from harmful dirt that damages hair so you have a gorgeous look that lasts. This iconic hair care product is infused with nutritious moisturizers that improve the health of your hair and provide you with a beautiful finish. You can request the luxurious Moroccanoil collection during your next treatment. Alterna Caviar is a scientifically proven hair care product designed with an Age-Control Complex that combats the chemical, environmental, and natural aging of your hair. Using cutting-edge technology, Glo Therapeutics has a unique formula that rejuvenates skin. Based on your skin type, this skin care collection delivers personalized solutions that will help you look your best. The Phytomer collection uses high-tech biochemistry to revolutionize the skin care treatment process. This innovative product line hydrates and protects your skin leaving you with a soft and smooth finish.